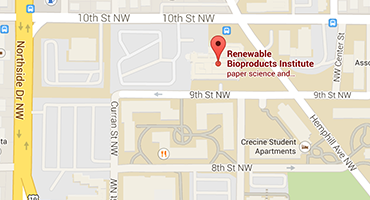 The Renewable Bioproducts Institute Endowment at Georgia Tech supports approximately 40 students each year who conduct faculty-directed research to advance technologies and applications in the bioeconomy. 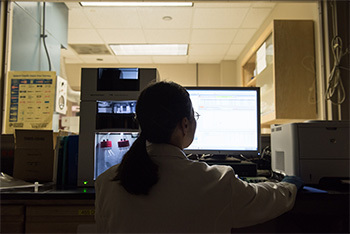 It offers an extraordinary depth of endowed research students and fellows – and breadth of faculty from six colleges and numerous research centers across Georgia Tech. The research is available to be accessed and leveraged in the spirit of open innovation. In 2014, the Georgia Institute of Technology received a major grant from the Institute of Paper Chemistry Foundation (IPCF). 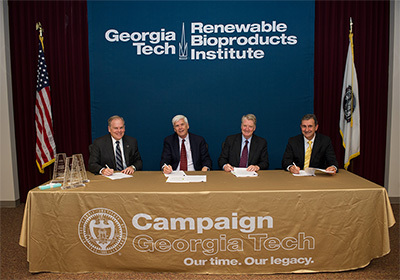 One of the largest gifts in Georgia Tech’s history, it affirmed the Institute’s position as the leading driver in the forest bioproducts arena. This gift constitutes the funding that supports the RBI graduate research fellowships. Through the endowment process, students are prepared to contribute to the evolution of renewable bioproducts and technologies in the marketplace; research investors have the opportunity to mentor or sponsor graduate students and influence selection of endowment-sponsored research projects. Investors can also engage in an array of other opportunities to access the vast expertise across the Georgia Tech campus, by sponsoring individual company or consortium research. Over the years, the endowment has generated a vast body of knowledge available to the industry and the general public. As allowed by intellectual property protections, the papers are published on Georgia Tech’s SMARTech site (https://smartech.gatech.edu) and other scholarly sites.